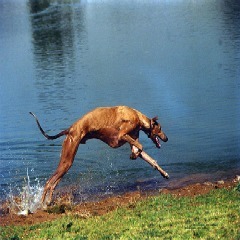 Basic Nutrition Greyhound nutrition is the one of the most important decision you make for your new pet. During their racing careers the food they receive on the track is a geared for high performance. Lots of protein for muscle building and good quantities of carbohydrates for the huge amounts of energy they need to perform well on the race track. Because of the monstrous amounts of calories they burn running they are given larger quantities of food than an at home greyhound will require. As a Foster Mom to greyhounds, right off the track, I have found they will immediately devour every scrap of food that hits the bowl. On the track they are often in competition with other greyhounds for the food, but even if they are individually kenneled they are still ravenously hungry. The day of the race they are not fed in order to avoid Bloat—a very dangerous twisting of the stomach. They come to believe that this meal may be their last meal and don’t want to miss a crumb. This is why greyhound nutrition must be address quickly. When you bring your greyhound home ask what the Foster people have been feeding them. Some rescue groups will provide a bag of the food they have been using as a “starter” diet. If this food has agreed with the digestive system of your greyhound stick with it. Changing a greyhound’s diet drastically can produce upset stomachs, vomiting and worst of all—GAS!!! Believe me there is nothing worse than greyhound gas. To introduce a new food be sure to do it gradually. I personally feel that it is important to give fresh food to my greyhounds. So I will put small amounts of cooked meat in their dry food, or a few cooked carrots. I have found that brown rice cooked with some chicken is a big hit and very good for their immune systems. Our St Paulie's Girl loves broccoli and carrots. If you find that their stool becomes soft or worse yet—diarrhea—then some cooked sweet potatoes with rice works like a charm. I cook some sweet potatoes and cut them into 2 inch slices and give them to my girls as a treat, they love it and it is better than giving dog biscuits all the time as treats. Click the link for some helpful hints when choosing a greyhound diet.